Shahidi, Fereidoon; Weerasinghe, Deepthi K.
Beverages derived from fruits and vegetables are a rich source of vitamin C, carotenoids, phenolics and polyphenolics as well as other bioactives. The bioactives in nutraceutical beverages may act synergistically with one another and their effect may be amplified through fortification, cultivating practices, or biotechnological means. 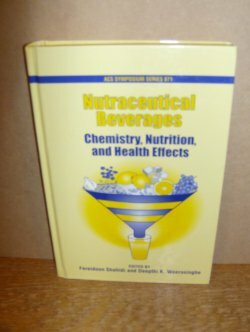 This book discusses factors in the formulation, chemistry, nutrition, and health effects of nutraceutical beverages. 489pp.